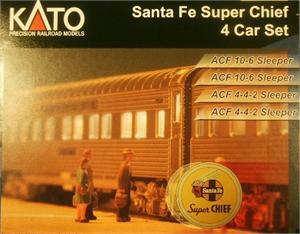 In 1935 the Santa Fe inaugurated its premier first class sleeping car only train the "Super Chief". 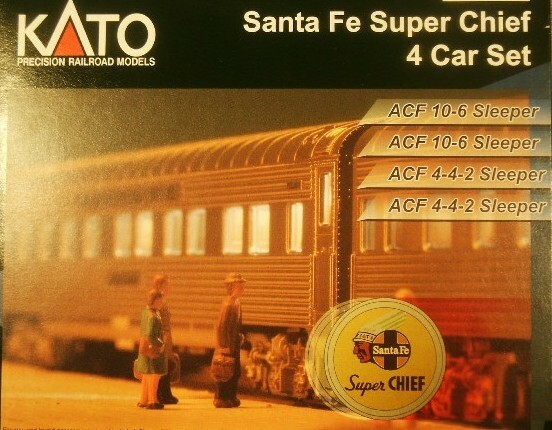 The "Super Chief" was frequently patronized by Hollywood stars because of its fine accommodations, fine dinning and fast 39 hr 45 min trip between Chicago and Los Angeles through the rich scenery of the American Southwest. It quickly became the most recognized train in the United States with its sleek silver and red warbonnet painted F units in the lead. ACF 10-6 Sleeper "Palm Haven"
ACF 10-6 Sleeper "Palm Top"
ACF 4-4-2 Sleeper "Regal Gate"
ACF 4-4-2 Sleeper "Regal Hunt"